A salt scrub can be great for the skin. A sea salt glow, also called a salt scrub, benefits your skin by exfoliating and removing old skin cells, leaving you with hydrated, smooth, more lustrous skin. Applied at a spa or at home, a basic salt scrub consists of marine salts and essential oils blended into a paste-like substance that can be gently massaged over the body. If you need to look extra special for some occasion, count on a sea salt glow to give you that radiant look. Just as sanding returns luster to hardwood floors or an old sailboat, scrubbing the skin with an abrasive ingredient -- like sea salt -- buffs away the top layer of dead skin, leaving a polished appearance that feels silky smooth. Exfoliation not only improves skin tone, but it can relieve the symptoms of certain skin disorders, such as eczema and psoriasis. Because of the high concentration of magnesium in sea salt, both the National Eczema Association and the National Psoriasis Foundation recommend using a sea salt glow as a method to reduce the itching and inflammation caused by skin diseases. A sea salt glow helps draw the toxins from the body and increases skin blood circulation, promoting the growth of new skin cells. 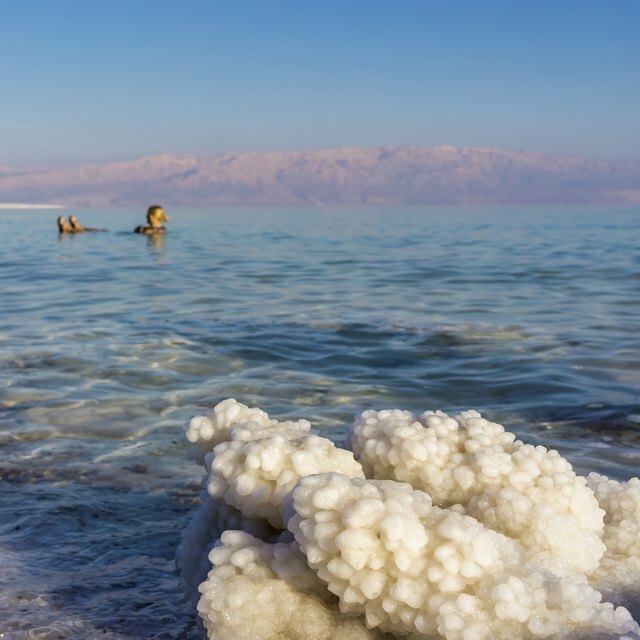 According to the International Journal of Dermatology, the presence of magnesium sulfate in marine salts, especially those from the Dead Sea, stimulates the liver and adrenal glands to dump their toxins. By detoxifying, you assist your immune system in fighting infections and illness. Sea salt, which is laden with minerals, nourishes and hydrates the skin. Essential oils are also used in sea salt body scrub recipes, and these oils not only smell good, According to Elle.com, sea salt baths act as moisturizers that soothe dry and irritated skin. Most salt glows contain blends of natural essential oils that can arouse the senses, revive your mood and make you relax. Marine salts are rich in bromides, which are natural sedatives, so a sea salt scrub can give you a sense of calm and relaxation. Elle.com also notes that salted water is rich in minerals that have a relaxing effect on nerves and muscles.